Jack Ziebell will make his earliest start to a pre-season in several years, with the North Melbourne skipper expected to resume full training within two weeks following post-season knee surgery. Ziebell's recent pre-seasons have been restricted by a succession of different injuries that have severely limited the amount of work he has able to do over the summer, particularly before Christmas. The Kangaroo captain had yet another operation at the end of the 2018 season, undergoing a "clean-out" of a knee that had begun to trouble him late in the year. However, Ziebell told reporters at Arden St on Friday morning the operation had been so minor he had been back running within a few weeks. And the forward/midfielder believes he can set himself up for a big 2019 by getting some pre-Christmas training under his belt. "I'm probably a week or two away from main training, but that's probably well ahead of where I've been in the last few years," Ziebell said. "I've been restricted the last few years with some injuries so I'm excited to get a bit of work done before Christmas." Ziebell did not take part in a 'Yo-Yo' test held later on Friday morning, but would have been impressed watching rookie Tom Wilkinson dominate the gruelling repeat sprint session to win from midfielder Jy Simpkin and second-year defender Tom Murphy. Despite his limited 2018 pre-season, Ziebell enjoyed an outstanding year in a new role playing predominantly as a stay-at-home forward. Released from his usual midfield duties by the emergence of Jed Anderson, Jy Simpkin and Paul Ahern as inside ball-winners, Ziebell proved a natural forward with his uncompromising attack on the ball and strength in the air, finishing second on the Roos' goalkicking list with a career-high 35. 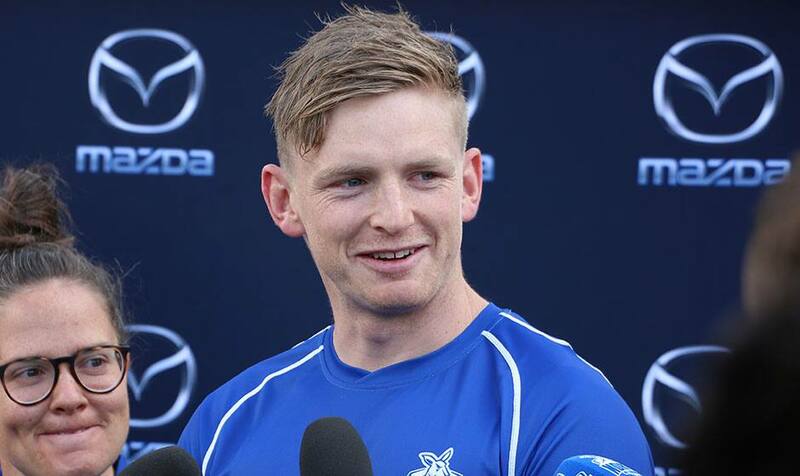 Ziebell has yet to discuss his 2019 on-field role with coach Brad Scott but expects he will continue to spend extended stints in attack, particularly since North bolstered its midfield with experienced recruits Jared Polec, Aaron Hall and Dom Tyson in the NAB AFL Trade Period. The skipper says Polec, Hall, Tyson and fellow Trade Period acquisition Jasper Pittard have "hit the ground running" since arriving at Arden Street and are impressing with their professionalism and work ethics. "They've only been here for two weeks but from what I've seen from those guys they're, one, quality people, which is what we want at our football club, but, two, very professional and very hard-working," he said. "So I think they are going to set themselves up for quality years." 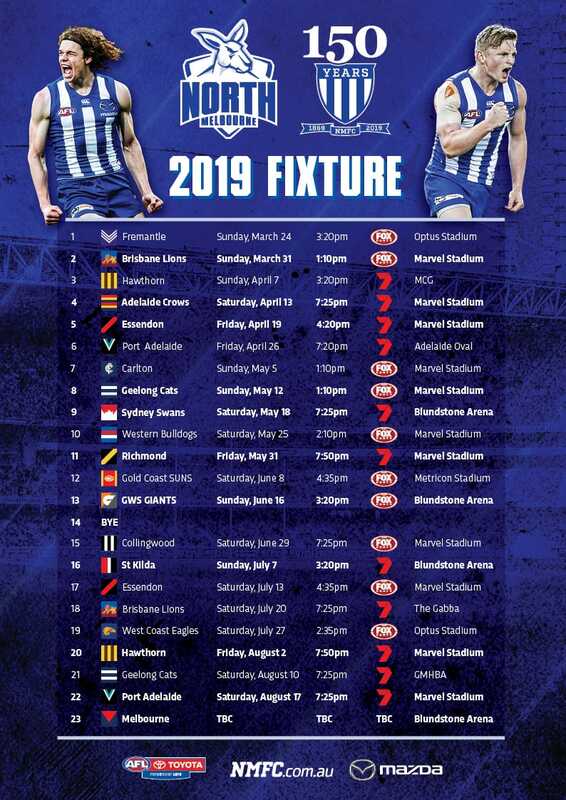 Despite Ziebell's high hopes for his new teammates, he says North's core group of young players will determine whether the club improves on this year's ninth-place finish. "The guys we've added obviously will help us improve but I think the biggest improvement this year will come from the core team we have at the moment, our young guys coming through," he said. "We saw last year with a few guys like Trent Dumont, Jy Simpkin and Jed Anderson really improving, that's where I think our improvement is going to come from, from that core group of players improving again and making us a hard group of players to play against." On Friday morning, North announced its long-term major sponsor Mazda Australia had extended its partnership with the club to sponsor its AFLW team ahead of its inaugural 2019 season.